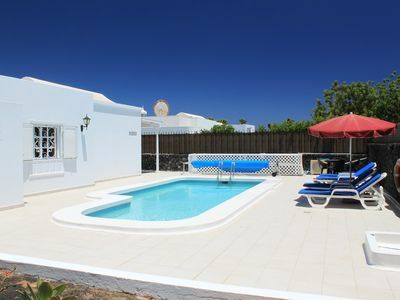 Casa Clarisa is a two bedroom, two bathroom detached villa with a secluded private heated pool and private parking in the much sought after resort of Puerto del Carmen on the beautiful island of Lanzarote. The villa is located off a quiet street in the popular area of Los Pocillios within a 5 minute walk of the fabulous Los Pocillios beach (400 metres from the villa) and the popular strip of Avenida de las Playas, which has an abundance of restaurants, bars and shops and a seafront view as you stroll along to the old town port and marina. 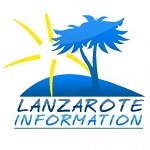 The detached private villa is well furnished to a very high standard. It offers everything that you could possibly need for a perfect relaxed break. It has two spacious bedrooms, (main bedroom with 1 double bed and en-suite bathroom; 2nd bedroom with 2 single beds) with plenty of wardrobe space, cosy lounge area with comfy settees, well equipped kitchen, spacious terrace with BBQ and outside dining area, garden, private heated swimming pool (heated Nov – March), private parking space within the grounds of the villa, utility room with washing machine, clothes rack, iron and ironing board. Internet access and Wi-Fi is available for FREE. British/ Irish TV channels including Sports channels are also available at no extra charge. All bed linen, bath towels and pool towels are provided. Highly suitable for couples and families. A welcome pack of water, orange juice, milk, biscuits, tea and coffee is provided. Casa Clarisa is cleaned prior to arrival and any stays of 10 days or more will receive a mid week clean. The pool is cleaned weekly. £750 per week for 2 guests. £850 per week for 3/4 guests.